And Pilate posted a sign on the cross that read, "Jesus of Nazareth, the King of the Jews." The place where Jesus was crucified was near the city, and the sign was written in Hebrew, Latin, and Greek, so that many people could read it. Then the leading priests objected and said to Pilate, "Change it from 'The King of the Jews' to 'He said, I am King of the Jews.'" 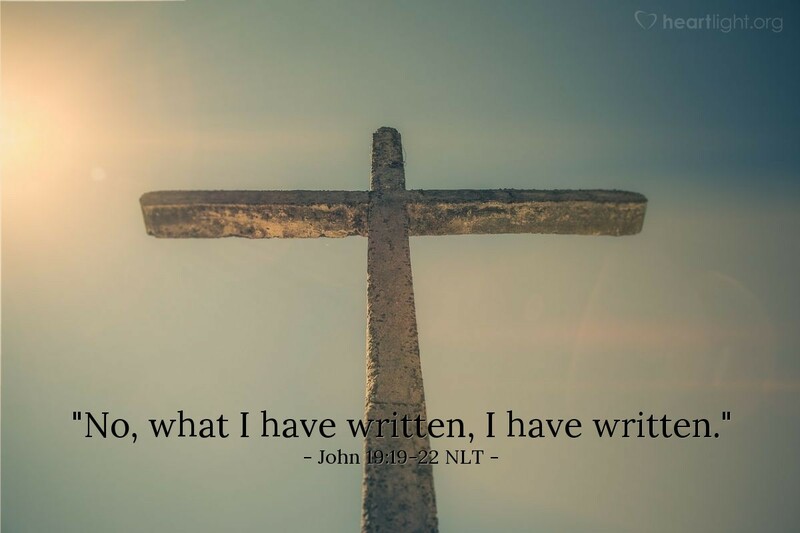 Pilate replied, "No, what I have written, I have written." The sign declaring Jesus to be the King of the Jews was written in Hebrew (the Jewish language of faith and promise), Latin (the language of the empire), and Greek (the language of trade) so that many people could read it, understand it, believe it, and find life in the King who also is the Savior. Jesus isn't the Savior just for the Jews, but for all people. So while dying outside the city like a despised criminal was horrible, God used the cross to be the place that many people could find that his love would reach them and save them. Loving Father, every time I think of the cost of the cross, I am humbled that you would love me so much. Motivate me by that grace to share your love with others so that they, too, can find life in Jesus, in whose name I pray. Amen.